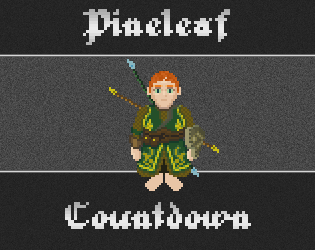 Pineleaf Countdown is a fun timer/alarm application created specifically for the LOTRO Players community. It was inspired by a fake ad for a fictional version of the app which aired on an episode of LOTRO Players News. The fake ad immediately prompted discussion in the live chat and the suggestion that someone should make it into a real app, so I set about making it happen. I could have thrown a simple timer app together rather quickly, but I wanted to do much more. Rather than a one-note joke about Pineleaf counting down the time, I wanted Pineleaf Countdown to serve as a virtual Pineleaf, full of comments and inside jokes the LOTRO Players community (as well as players of The Lord of the Rings Online™ in general) will appreciate. I even wanted to provide a glimpse of what goes on in Pineleaf's hobbity head. With more than 50 recorded comments (voiced by Pineleaf himself) and a plethora of randomized thought bubbles, I believe that Pineleaf Countdown will quickly exceed your expectations. Pineleaf Countdown includes a Timer which can be set for up to an hour and an Alarm which can be scheduled for up to 24 hours away. Your virtual Pineleaf will count aloud the time remaining every ten minutes during the last hour. Additionally, there are several configurable options (including various optional count settings) so you can set things up just the way you like. And of course, it's completely free and available in dedicated apps for Windows and Android, as well as an HTML5 web app which will work with any HTML5 compatible browser. With Pineleaf Countdown, you'll never worry about missing a raid again! Looking for the HTML5 web app? Find it HERE. Android 4.0.3 or higher is required for the Android app.